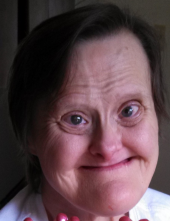 Brenda June Meek, age 63, a resident of Society for Handicapped Citizens, Pell Home, in Westfield Center passed away Tuesday, Sept. 11, 2018. She was born May 18, 1955 in Lodi to Clare and Donna (George) Meek. She had been a resident with SHC for 30 years, where she was affectionately known as “Meekers” by the staff. A Celebration of Life will be held Sunday, Sept. 30, at 1:00 PM at The SHC Lodge at Camp Paradise, 4283 Paradise Rd., Seville, OH 44273. Memorial contributions may be made to SHC or the family to be used for her Celebration of Life. Arrangements by Parker Funeral Home, Lodi. "Email Address" would like to share the life celebration of Brenda J. Meek. Click on the "link" to go to share a favorite memory or leave a condolence message for the family.